Happy Hump Day!! I hope everyone had a safe weekend and is getting by this work week as best as you can! Today's post is going to start off with me discussing my addictions! Besides my love for shrimp, I am also addicted to youtube and the blog world. I go to bed doing one or the other, sometimes even both. Some may not understand my addiction but it is kind of like those people who use all there energy scrolling up and down twitter, facebook, and instagram feeds! So you might ask, what does this have to do with the title Poshmark! Well, I look to youtube & blogs for different fashion, hair, and makeup inspirations daily. Thanks to a wonderful blog I stumbled on (the name escapes me at the moment), I was introduced to Poshmark!! Poshmark is a site that is made primarily for individuals to sell their used or non used items in their closet. You don't have to be a seller to only have access to the site, they also have it setup for you to buy awesome items from other people's closet. You can buy, trade, or even purchase bundles so that you are getting more items for that flat rate shipping amount. Check out the Poshmark FAQ to any questions you may have about Poshmark. 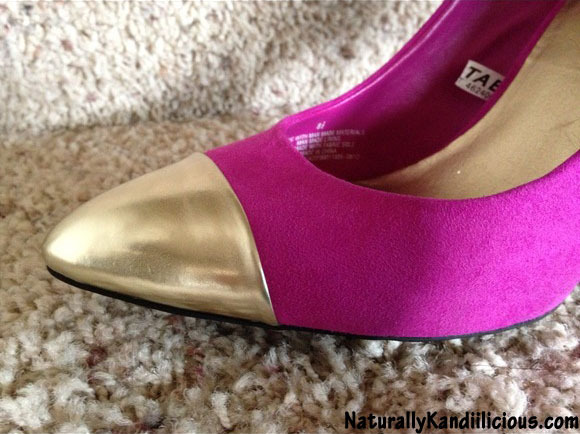 The very first day I was on Poshmark, I made a purchase for these fushia & gold cap toe pumps from target pictured below. Originally they were $29.99 and I got them for $23 which included shipping. Without shipping they weer 17.00. The transaction was great and the shipping came fast! 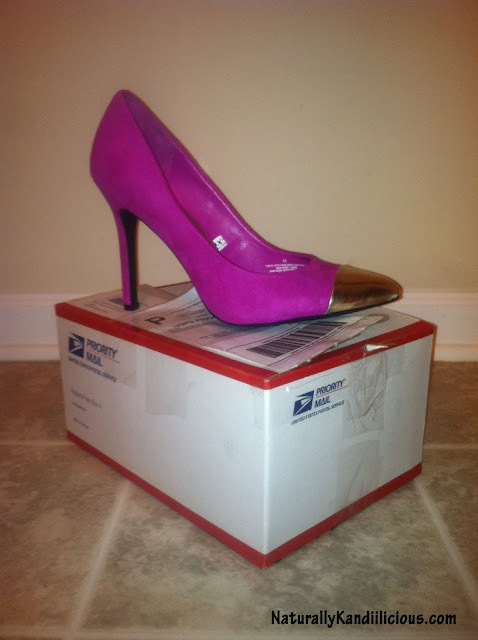 One of the benefits of Poshmark for the seller is that they are provided with a shipping slip to use to send out your item that was purpose. For the buyers no money will be deducted from your account until you have confirmed you received your package. The down fall is that any item under $25 will automatically be a $6 shipping fee so its best to try to get bundle deals if you can. These shoe were listed as NWT which means it is New With Tags. They were a size 8.5 and I knew that I could put these shoes to use for the price! I love these shoes. I wanted them when I first see them at Target but they either did not have my size or the color I wanted. Thanks to PoshMark I was able to find these shoes not only in my favorite color, but also in well condition and for about $10 cheaper. I will be posting my first item from my closet up later this evening. Use the "Shop" tab above in the menu's to get to the site. I will also leave the link to my closet below Be sure to check it out. So happy to have you on Poshmark! Thanks for spreading the love. Hi Maria! I am happy to be there! Thanks for stopping by! NICE SHOES!! Will def have to check poshmark out! !